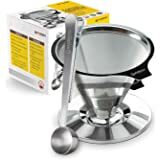 Sold by Chefast and Fulfilled by Amazon. Gift-wrap available. ULTRA-FINE QUALITY, UNBEATABLE PRICE: Looking for the ultimate combination of performance and value? With this all-inclusive loose leaf tea infuser set, you get three premium steepers in two sizes, so you can strain tea for both yourself and a partner, or you can brew multiple cups to serve an entire gathering. 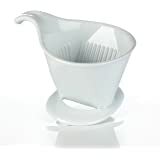 SPECIAL TEA SCOOP INCLUDED: Use our multi-functional scoop with integrated bag clip to add just the right amount of tea to the basket; then twist and let your tea come alive without worrying about unwanted debris falling into your cup. 304 IS THE NUMBER: That's the extra fine, premier-grade stainless steel we used in the construction of our loose tea steeper set. You'll find that cleaning it is simply a matter of running cool water through the metal strainers. This solid material also makes our infusers great for infusing spices and herbs into your favorite dishes and soups. PERFECT GIFT FOR TEA LOVERS: Our unique tea strainer set comes in a stylish box that makes it a great choice for a wedding gift, housewarming gift or any other kind of gift. GUARANTEED GOODNESS EVERY TIME: We back up our reusable tea balls with a full one-year warranty, so if anything goes wrong, a brand-new product is just a few clicks away. 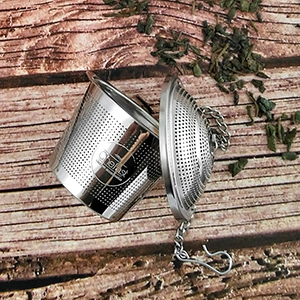 Order this premium mesh tea infuser set today and taste the difference yourself! Sold by Chefast and ships from Amazon Fulfillment. 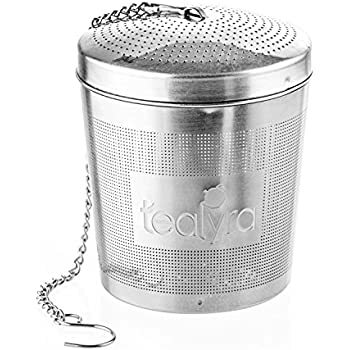 Have you tried to steep a cup of tea in one of those tiny tea balls and cringed at the taste? 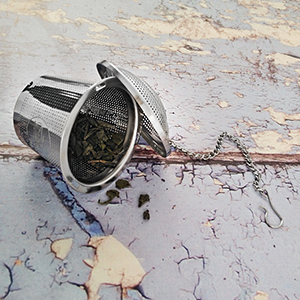 Are you sick of swallowing pieces of tea debris in every other cup you make? 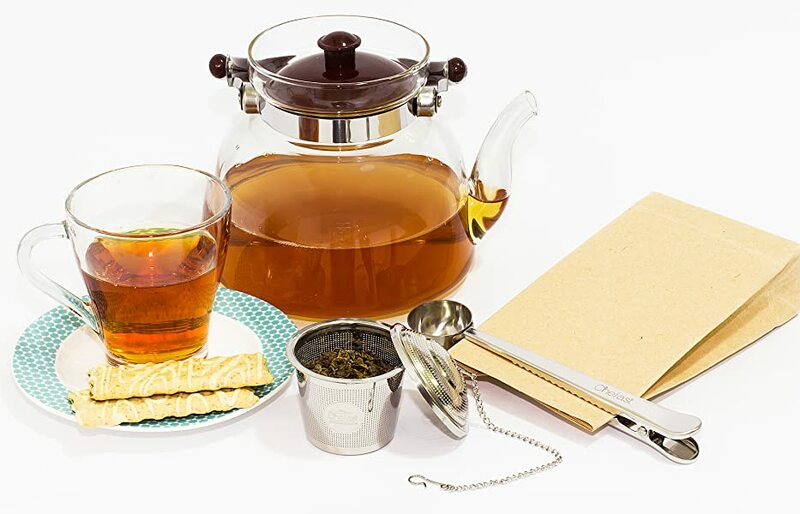 Welcome to the world of time-steeped tea that tastes the way you always knew it should. 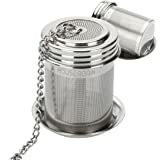 All you need to join the big leagues of tea drinking is some quality loose-leaf or fine tea and our premium tea infuser set. 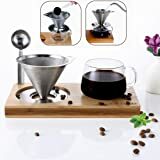 With two different-sized tea strainers for loose tea, and a tea-coffee scoop with integrated bag clip, brewing tea for yourself or your family has never been this fun and easy. 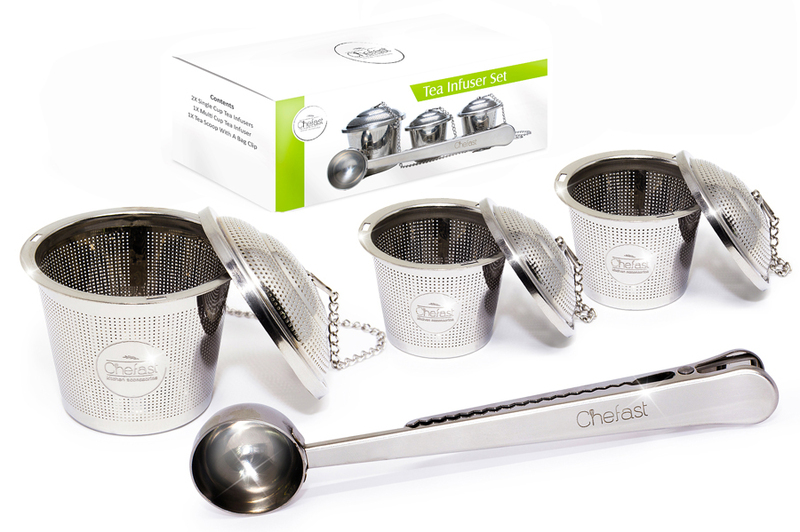 Why Should You Choose The Chefast Tea Infuser Set? 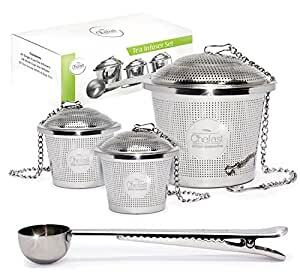 With solid construction of 304 grade stainless steel, this mesh tea infuser set by Chefast is going to be a staple in your kitchen for a long time to come. All you need to do is rinse it under cool water, and you’re ready to steep another batch. You’d be surprised how many people simply aren’t aware just how good their tea can taste if it’s properly steeped. Share the tea taste sensation with them every day – gift them this tea infuser set on the next special occasion or for no reason at all. They’ll love you for it many times over! When It Comes To Preparing Premium Tea, Make Sure You’re Using Premium Tools. We promise that you and your guests will be able to taste the difference! 5.0 out of 5 starsFantastic company!!!!! 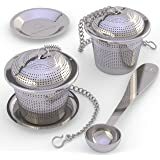 I purchased this three piece tea infuser set. When they arrived the two small ones were perfect but the larger one was very difficult to open and close. I didn’t feel like bending the tabs was the answer for many reasons: it’s onlt going to make the problem worse and weaken the tabs, mostly. So I put it with the others and thought I’d figure it out. 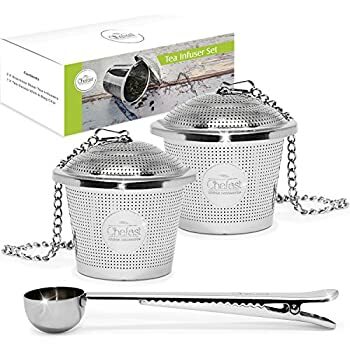 They sent me 2 more large infusers free of charge!! When the package arrived the box seal was broken. No red flags, I knew instantly what this meant! The company had opened the box to test the infusers to make sure I was getting a functioning product! Perfect!!! What a fantastic company and now I have nice infusers for my tea pot!!! I love these infusers too!!!! If you decide to purchase keep an eye on your email if there is a problem they WILL make it right!! 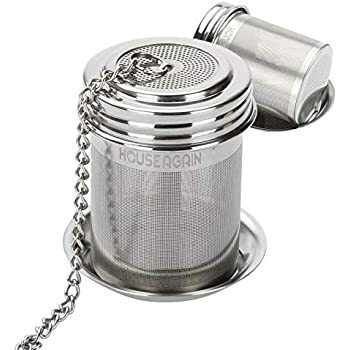 I adore this tea infuser set. 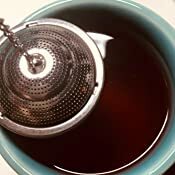 The super fine filtering is wonderful at keeping the tea particles inside the infuser and out of my drink. 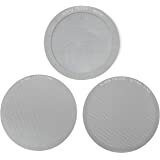 It is not a wire mesh that will loose shape, it is a thin metal with fine holes. 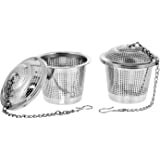 These infusers not only allows for a blissfully delicious cup of tea but easy clean up as well. 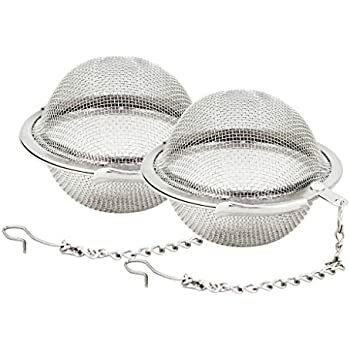 My other tea strainers were the super fine mesh. Cleaning the tea from them required me to use a brush. That is not the case with the Chefast tea infuser. I simply have to rinse them under hot water and they are completely free of all the tea leaves. They are also large enough that the tea is able to expand while steeping. These are worth every dollar and penny I spent on them. Metal started to turn color & rusting. Cannot believe this is safe to use for drinking tea.... I don't know how they sell these things legally. 1.0 out of 5 starsHorrible fastening mechanism on the smaller infusers. Poor engineering. 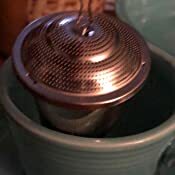 The smaller infusers fail to keep the lids fastened down. 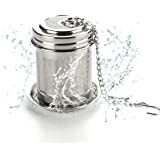 It's very annoying when the lids repeatedly pop off while the infuser is submerged in a hot mug of water. Even after attempting to tighten the fastening tabs, it keeps happening. The larger infuser seems fine for now, and although it shares the same basic fastening mechanism, it seems a bit better built. In the future I would order an infuser with a more reliable screw-on mechanism. 5.0 out of 5 starsMakes brewing whole leaf tea a pleasure! Previously, I was not thrilled with using whole leaf tea due to using an inferior infuser. Having the Chefast brand has made a world of difference! It's beautiful, well designed and good quality. It's easy to use and easy to clean (a huge plus in my book!). 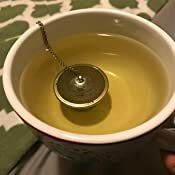 The taste of the tea is very clean and fresh, something new to my experience. 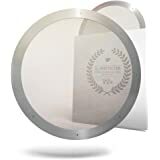 The scoop that comes with it is perfect, and I appreciate the e-book and other document which is emailed to the purchaser after delivery. I would recommend this set to anyone who appreciates a superior cup of tea. The rim of the large infuser broke off the basket with minimum pressure! Being an avid tea (and kava) fan, I was really excited about this set. They're made well, but the holes are too small to allow for proper steeping. 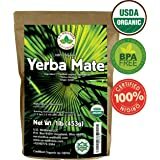 Teas and herbal brews are okayish, but kava comes out very weak, even with agitation or using a spoon to manipulate the root inside the basket. 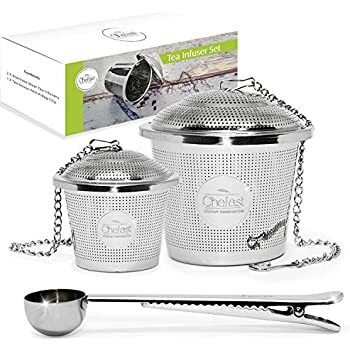 These strainers might suit the needs of some, but I won't buy again. I don't know how long this set will hold up, but after several weeks of use I am quite happy with it. It claims to be substantial stainless that will not deteriorate and it sure seems to be so far. 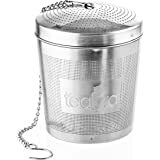 Strainer is thin, but keeps tea grains and fine herbal grains nicely encased, I'm not spitting out any dregs when enjoying my tea. 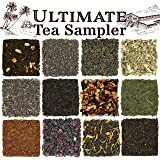 I use multiple styles of tea ranging form powdery to long grain, sometimes mixing several. 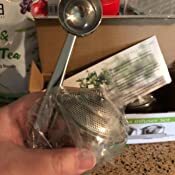 Strainers clean out nicely and I love the ability to make one cup or multiple cups. If these ever break and I need more, at this point I'd buy the same again.